The Heart of Arcachon Bay is fortunate to belong to the largest man-made forest in Western Europe: the Landes of Gascogne Forest. The Heart of Arcachon Bay is fortunate to belong to the largest man-made forest in Western Europe: the Landes of Gascogne Forest. That’s right! These pine trees do not grow here naturally. Most of them were planted by order of Napoleon III to secure the dunes, improve the drainage of the marshes, and provide the local population with productive trees. This period marked the beginning of the area’s resin harvesting and wood production. Today, this activity continues, thanks to the development of tools and production methods, which are renewing and protecting this environment. 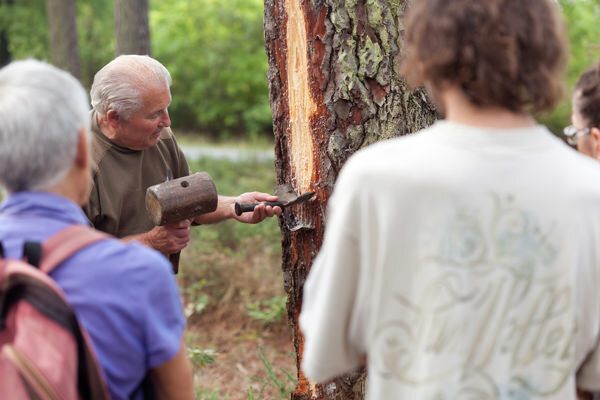 In Lanton, you can register for a pine-tapping demonstration. Here at the heart of the forest, a certain Valentin will show you the age-old method used to extract resin from pine trees.